Once known as a Yucatecan Hacienda during the eighteenth century, the Hacienda Misne is now a beautifully renovated hotel nestled in the heart of Mérida, Mexico and surrounded by a lush tropical setting. In 1988, this restored hacienda approached traditional Yucatecan hospitality through a new lens. 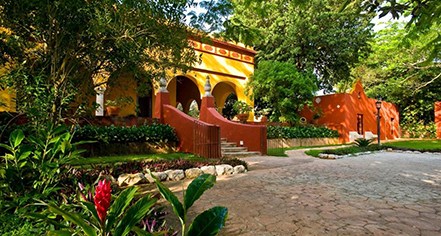 Featuring the unique blend of Spanish and French architecture, the Hacienda Misne boasts contemporary decor, pebbled paths, and colorful gardens, creating the perfect fusion of modern comfort and enriching history. The historic 42 spacious guestrooms and 8 stately suites open up to the beautiful gardens and have deluxe bedding coupled with a calming atmosphere. Some living spaces feature private plunge pools and hammocks, promising relaxation. The on-site restaurant specializes in gourmet local cuisine and specialty cocktails in a cozy cantina setting while the meeting facilities and sprawling gardens are the ultimate gathering spots for exclusive events. Located just outside of Mérida’s vibrant and historic downtown area, Hacienda Misne is just steps away from one of the oldest cities in South America. Known for its rich culture, exquisite cuisine, and stunning architecture, this area is teeming with history, notably the fascinating folklore of the Yucatan Peninsula. After a day of exploring this authentic city, guests can return to the Hacienda Misne and unwind in a truly luxurious setting. 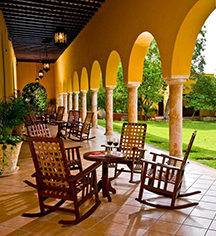 Hacienda Misne, a member of Historic Hotels Worldwide since 2015, dates back to 18th Century. One of the most popular singers from the Epoque era, tenor Nicole Urcelay Alonzo, lived in Hancienda Misne for a season in the 1940s. Pet Policy: Service animas allowed: Please contact hotel. Pets allowed: No. Once known as a Yucatecan Hacienda during the eighteenth century, the Hacienda Misne is now a beautifully renovated hotel nestled in the heart of Mérida, Mexico and surrounded by a lush tropical setting. In 1988, this restored hacienda approached traditional Yucatecan hospitality through a new lens. Learn more about the History of Hacienda Misne .